Exciting news from on high! A new feature is about to be launched: Prize Draws! Now you have the chance to get your hands on piles of Sapphires, Units, and other powerful Items! Players of Level 21 and above will now be able to try their luck in a variety of different Prize Draws: Express, Standard, and Epic. To take part in a Draw, acquire a Ticket and enter the Draw of your choice. Once a set number of tickets have been entered, the Prize Draw will take place, and the lucky winner announced! Winners are selected at random, but you can enter multiple Tickets into a Draw. The more Tickets you enter, the better your chances of winning a Reward! 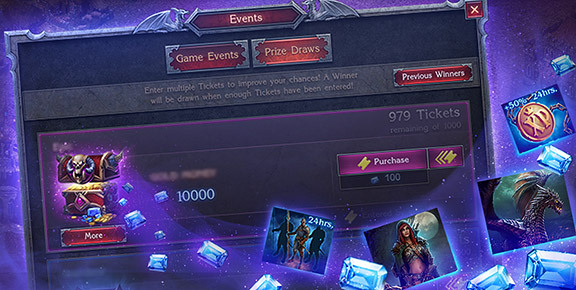 To participate, open the Events window and find the "Prize Draws" tab: from there, pick the Prize Draw that you wish to take part in and enter a Ticket! You can enter a single Draw with multiple Tickets, or alternatively spread your Tickets across multiple Draws. Remember, not all Prize Draws are the same – some yield bigger Rewards than others – so keep your eye out for some truly spectacular prizes! Fortune favors the brave, Lords and Ladies! Explore Prize Draws today!